In this post I am going to show how you can insert bulk data by using DataTable of C# and OpenXML function available in Sql Server. push all record in the database table". Other thing is when inserting data in database if there is failure during insertion of record, I have to rollback all inserted record. I created procedure which make use of OpenXML function of the sql server which allow to insert multiple record in one time. OpenXML require xml string of record to insert data in the database. As you see in above procedure OpenXML make use of xmlDocument as input which is get created by system define procedure sp_xml_preparedocument which take xmlString as input and return XmlDocument. Once OpenXML done task of insertion sp_xml_removedocument system proceudre is require to remove that element. All record get inserted in once by the OpenXML function as I used transaction if the one record insertion fails all inserted record get rollback. As you see in I am passing Element centric xml to the proceudre. 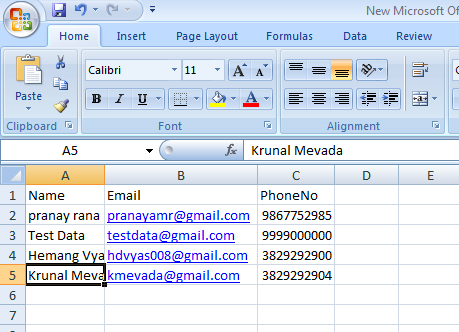 Now after done with the database , code part of the application is as below. 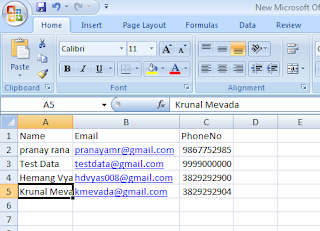 Following function in presentation layer read data from the excel file, which is uploaded on server. Function below takes DataTable as input and generate XML string, As you see below I used StringWriter which use StringBuilder object, DataTable make use of StringWriter and write XML string in StringBuilder object. Note:Above method generate Element centric XML string. Now if you want to write out the Attribute centric xml file you just need to replace the line of datatable.WriteXml with the below code for loop also you dont require to use the StringWriter object. Now this layer call the stored procedure which pass the xmlstring of employee to database. Return parameter will tell that its successfull insert or not. Note : This is the one technique I found useful to enter bulk amount of data in database in one transaction. There are also other available which might be more efficient than this. This is a great sample! awesome job! would you happen to have the source posted somewhere? When the "cmd.ExecuteNonQuery();" executes then I am getting above "OutOfMemoryException" . I assume that the problem with Converting XElement to String.